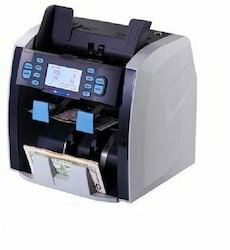 Our Note sorting machines are based on advanced counterfeit detection & CIS based technology. Fully programmable for various options to suit individual customer needs. 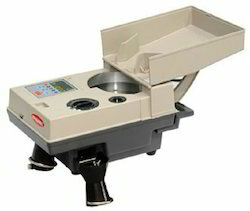 Very small foot print & compact in size, but delivers Performance equivalent to multipocket note sorting machines. currency sorter has been developed on one of the latest platform and microchip which has multi level programming capability and has high user friendly user interface which other sorters miss. 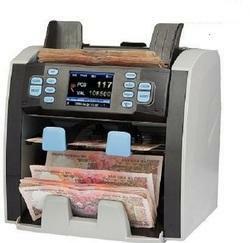 Bank note sorter the Next generation sorter for Indian Rupees. Hi-Speed - Compact - Robust Currency Sorter for Indian Rupees. Real Time Date Time display. Automatic sensor component monitoring system. *Features are subject to change due to continuous product development. 1+1 Fitness Note sorting machines is Professionally Built based on Advanced Counterfeit Detection, Tape detection Double CIS based technology. Very small foot print compact in size, Yet delivers Superior Performance. No Update Required for Piece Counting of NEW 2000 NEW 500 notes. Upgrade for New Notes only for Special Sorting Functions, which will be available from Nov 25th. Please Contact Our Service Dept. for Upgradation. Precise counterfeit detection - UV, MG, MT, IR, Tape detection, CIS, etc. Fitness Sorting like Soiled, ATM, Doggy fold, Tape detection, etc. 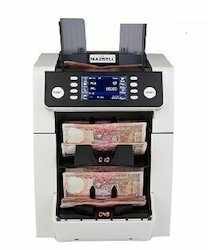 2 pocket full fitness function Banknote Sorting Machine - the most professional design which can be a saviour to the backup cash management services for Banks or Customers who deal with bulk cash and need to process in short time. - Noise Dust block door which can help user from getting affected due to currency dust. - Mechanical Tape and thickness detection for reliability in detection. Double face image recognition, fitness sorting, quality sorting, denomination sorting, face/orientation sorting,etc. Accurate serial number recognition, storage and management. Accurate thickness sensor, a variety of counterfeit detection technology including IR, magnetic, image, UV, etc. Design of open channel, easy maintenance and jam removing. Built-in dust collection design, fully automatic banknote dustproof door. Humanized intelligent design with dual-operator user interface; large color touch screen LCD, key-press and touch screen available. Already Used by RBI, Metros Across India Casinos. * Rugged Steel construction for Lifetime service.